A cereal grain that contains bran, germ and endosperms is a whole grain while refined grains are those that retain only the endosperm after being processed like white rice. Grains are the seeds of grasses cultivated for food. They are valuable sources of fibre and vitamin B12. Fibre takes time to digest and makes you feel full for longer. This also helps in keeping blood sugar and insulin levels down. All grains are naturally low in calorie density. If you eliminate grains you tend to over eat other foods which could lead to more body fat. Wheat is one of the most commonly consumed cereals in the world providing about 70 percent of the caloric intake in the form of staple food..
Best ways of consuming wheat: The best way of taking wheat is in the sprouted form chewing it well or adding to salads, which supplies easily digestible proteins, enzymes vitamin B, and E and simple starches. For many as it is not practicable the second best way is in the form of mash (Dalia) or rough porridge where the grain is just broken into tiny particles. The third best way is the whole wheat flour produced by a slow moving mill or grinding between two stones. 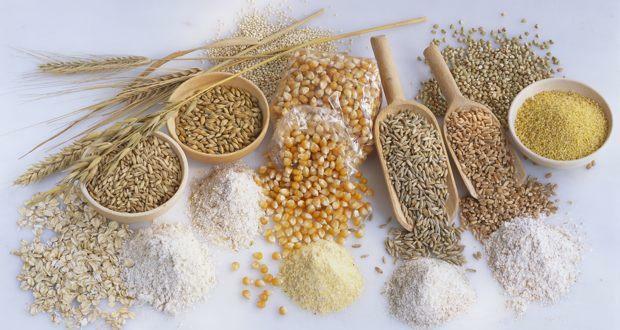 Disadvantages: Avoid wheat products in chronic colitis, ulcerative colitis, and colic diseases where gluten interferes with absorption of nutrients in food. This ancient grain has gracefully made its way into modern meals. We’re not fans of the word but it’s our very own superfood. Its high protein content sets it apart from others. Another reason to love this grain is that it’s gluten-free. Grind the grain into flour and use it in breads or pancakes. Amaranth seeds can be roasted, toasted or boiled and added to other dishes. This is a wonderful grain that doesn’t get the attention it deserves. It has an abundance of potassium and the highest amount of fibre amongst others. With a chewy texture, barley is great in stews, soups and salads. It is rich in cellulose or fibre and carbohydrates. It is rich in Vitamin E, minerals such as calcium, copper, Iodine, iron, magnesium, potassium and rich in amino acid L tryptophan. •	It is good for digestive and nervous system as it contains an important ammo acid L tryptophan and is helpful for sleeplessness, depression, anxiety and premenstrual syndrome. •	It contains a substance “hordenine” which is tonic for the heart and have an antidiarrhoeal properties. It is a soothing drink used medicinally to treat children suffering from diarrhoea and sickness. •	Germinated barley contains enzymes that can relieve loss of appetite and hyperacidity. However cooking destroys these enzymes. So the best way to benefit from the medicinal values of the cereals is to drink, barley water made from germinated barley and if possible should be taken raw for maximum nutritional and health benefits. •	Barley is a good diuretic among cereals. Barley water made after cooking cereals is very beneficial in all urinary and kidney disease conditions. In case of white rice, most of the fibre and many of its nutrients are left behind in the milling factory. In contrast, brown rice is rich in fibre and high in Vitamin E.
Bajra is widely used in Indian cuisine and is packed with iron and calcium. Other millets like Ragi and Jowar are also smart carbs and gluten free. •	Being rich in fiber content, bajra is good for diabetics, keeping the glucose levels normal. •	This whole grain supports weight loss as the high fiber content leads to a feeling of fullness for a prolonged period of time. •	It is helpful in maintaining cardiovascular health and in acidity problems. •	Bajra helps in reducing weight. Disadvantage: Persons with kidney and rheumatic diseases should use it with care. It is gluten-free, Rich in fiber, high protein, full of iron, high magnesium and Packed with vitamins, minerals and micronutrients Popping and flaking of jawar implies starch digestibility five times but reduces protein digestibility in flakes. Whole jawar recipes significantly lower plasma glucose levels and very useful for non Insulin dependent diabetic persons. It is very nutritious cereal. Unlike other cereals, it is mostly consumed without milling, which helps it to retain all the nutrients. It is one of the easiest foods to digest and is very high in dietary fibre. It is nch in Carbohydrates and to be used sparingly by obese people. Yellow corn is high in Magnesium, which is a very wonderful bowel regulator. It is a bone and Muscle builder and an excellent food for brain and nervous system as it is a rich source of Phosphorus. Corn mixed, malted or milk drinks provide calcium and B vitamins (B2 and B12) as well as protein. Maize contains around 11% of protein and its protein is deficient in amino acids like tryptophane and lysine. Yellow maize is a good source of carotene for vitamin A. it also contains Thiamine and folic acid in appreciable amounts. •	Chewing fresh roasted corn is very good for the gums and teeth and prevents gastric ulcer and protein deficiencies in underfed children. •	Corn grains consumed daily help to keep a check on the blood cholesterol level. •	Corn flour paste in water acts as an effective face pack to remove acne and other skin blemishes. •	Corn is suitable for people with gluten intolerance of wheat in colic diseases to the intestines and irritable bowel syndrome. •	Cold pressed corn oil is rich in poly unsaturated fats and helps to reduce heart attacks, arteriosclerosis causing hypertension. It is an excellent source of starch, protein and soluble fibre and vitamins especially folic acid, It is also rich in minerals, calcium iron, magnesium, phosphorus, potassium, sodium and zinc. Disadvantage: Oats contains gluten and can be avoided for gluten intolerance conditions such as coelic diseases of intestines and Irritable bowel syndrome. Ragi is rich in cellulose or dietary fibre. Therefore its regular use is an excellent laxative for chronic constipation. It is rich in calcium and iron. In fact it is the richest source of these minerals among all cereals. The major proteins of ragi are prolamins and glutelins and they appear to be adequate in all essential amino acids, It contains B vitamin but is poor in B2. Ragi meal is an Ideal food for diabetes and obese because its digestion is slow and glucose is released from the intestines very slowly into the blood. By eating ragi preparations the constant desire to eat will become less and supplies less calories for obese people. Disadvantage : Excess use of Ragi preparations increases oxalic acid, hence it is contraindicated in persons suffering from urinary calculi.